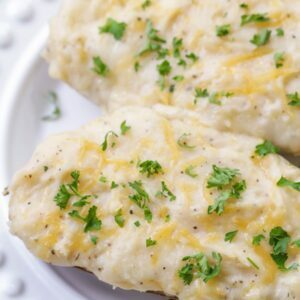 These Cheesy Alfredo Potatoes are cut in half and scooped out, then topped with potatoes, alfredo sauce, garlic powder, thyme, and lots of cheese! Pierce potatoes with a fork in several places. Bake at 400 for 1 hour. Let cool 10-15 minutes. In a bowl, mix together alfredo sauce, garlic powder, pepper and thyme. Stir in half cup of cheddar cheese and ¼ cup of mozzarella cheese. Cut potatoes in half and spoon out potatoes, leaving a thin shell. Mash or pulp potatoes with alfredo mixture. Spoon into potato shells. Sprinkle with remaining cheddar cheese & mozzarella. Bake at 400 for 20 more minutes. Enjoy!